I started the day by checking out Darren Donovan’s demo on creating 2D FX in flash. I thought the demo would have been great if Darren had more time and had proper setup he was used to instead of trying to make do with a tiny tablet. Though brief, it was cool to see Darren drawing rough keys for fire effects. I’d love to see the whole process from start to finish someday. The First Panel of the day was “Compelling Character Design” with Dave Cooper, Jessica Borutski and Stephen Silver. In the hour long discussion the three artists talked about the aspects of the process that appeals to them and what each of their clients/directors expected from their position. “Creating Success” panel had five artists in the industry who each had a show green lit. (Photo Above) Rob Davies, Dave Cooper, Mike Geiger, Michael Rex and Natasha Allegri all had different journey in becoming a show creator and it was insightful to learn how they got to where they are now. Mike Valiquette has been friends with couple of the panelists so it was great to have him as moderator as we got to hear bits of more intimate details of the back stories. Additionally, it was good to hear Michael Rex’s story on how Fangbone came to be as I have animated for the pilot episode last year. At “Writing for Animation” talk, Rob Davis, Heather Jackson, Rob Pincombe and Shelley Hoffman talked about their experience as Director of development, freelance writer and story editor. Heather shared her experience on how she got her foot in the industry. Rob & Shelly gave insight on how they work with the writers to keep the spirit of the show consistent throughout one episode to the next. In general all four panelist had great advice on what kind of mindset to have when writing for animated shows and working with clients. 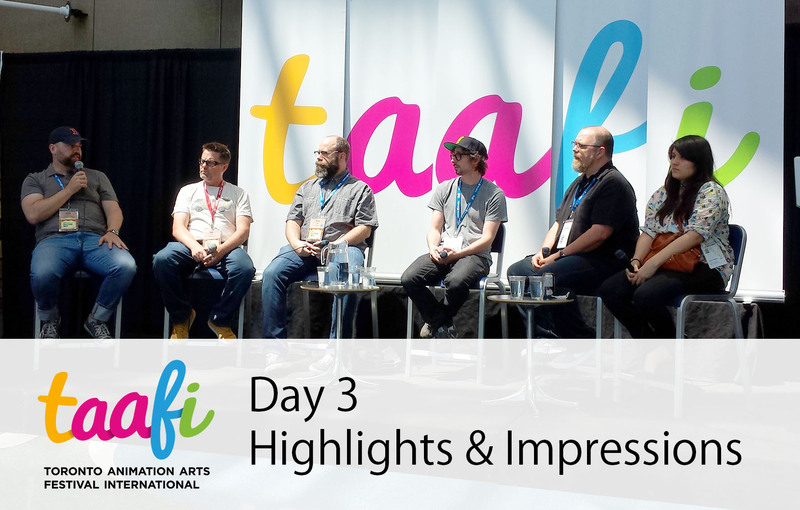 TAAFI’s co-founder Barnabas Wornoff moderated “Storyboard Driven Cartoons” panel. Matthew Fernandes, Steve Wolfhard and Natasha Allegri shared their story boarding process from working with only 1-2 pages of story outline. My impression after hearing their thoughts is that storyboard driven shows are possible only when there are perfect combination of Directors with clear visions who are willing to chances on the hand picked multi-talented visual storytellers. The festival went on for little longer afterwards but I retired early today. Day 3 was much quieter as there didn’t seem to be as many attendees as day 2. I was quite disappointed by the lack of students and lack of working folks from studios in Toronto and around GTA. Tomorrow is the last day of the festival. I find it strange that it is on Monday which is working day for most people. There are still great panels lined up for tomorrow so it will be interesting to see the turn out for it. I’ll check back tomorrow evening and give overall opinion on the TAAFI festival weekend. This entry was posted on Sunday, June 15th, 2014 at 11:34 pm	and is filed under News. You can follow any responses to this entry through the RSS 2.0 feed.